Thanks for everyone who sent feedback, please keep it coming! I just deployed an update, v4.02.0, which addresses the highest priority feedback you've all sent and fixes a few bugs. - Unity: Added an option to the settings to allow caching maps on the device. This is useful for mobile devices to save bandwidth. All platforms get this setting except WebGL, since browsers cache the files automatically. - Unity: Sorted the Quickmatch Templates page so that checked templates are at the top. - Unity: Added a View button to the Quickmatch Templates page so you can see a template's full details. 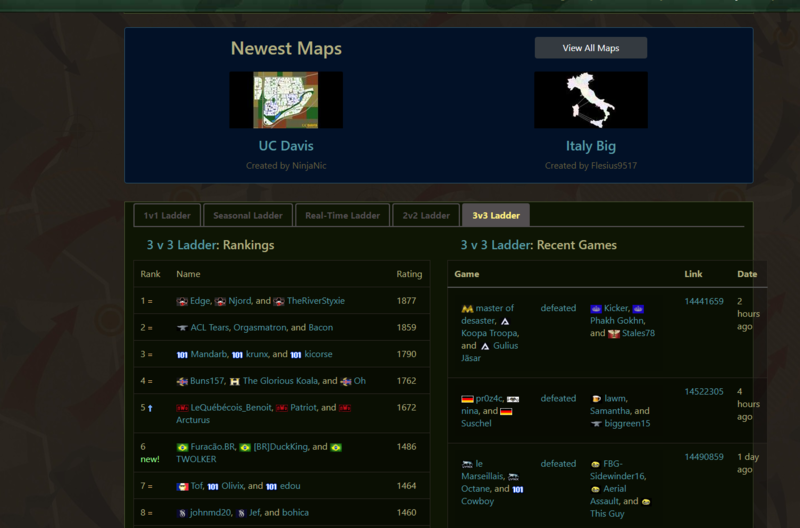 - Unity: Added a button to the Create Game page that allows viewing the currently selected map. - Unity: If you're in more than 15 games, the multi-player tab now shows your game in 15-game increments to keep the page running smoothly. - Unity: Fixed a bug with the "Zoom cutoff" setting in the debug menu. It now won't zoom to a value higher than desired. - Unity: Fixed a bug with the Report Bug page that made it not create mail threads. - Unity: Fixed "timer is null" error. Thanks to Champ for reporting this. - Unity: Fixed a bug that let audio sometimes play even when disabled. Thanks to Arand0mPlayer for reporting this. - Website: Widened the center column of the Clan page. - Website: The ladder page now stretches to use the entire browser width. Thanks to ps for reporting the layout problem on this page. - Website: The Create Coin Game page now scrolls the templates list so the page doesn't get too long. - Website: Fixed the padding at the top of the menu on the website when opened from a device. - The "Win on X different maps" achievements are no longer checked after every game, and instead get checked 20-30 minutes later when your profile updates. This helps to fix the performance problem that people encountered when ending games (commonly referred to as "surrendering is slow"). - Removed "Created by a mod" text from GameOrderEvents since they're used by commerce games now, which isn't related to mods. Thanks to dabo1 for reporting this. - iOS update will be sent to Apple soon. Just need to finalize the logic for the iPhone X related changes. Thanks to Muli for helping out with this. - New graphics voting is underway. I will soon tally the votes and narrow down finalists. This will be fixed now in 4.02. Sorry about that. You're right, you reported it first. Could there be an option for "group-chat" where you can open a chat-window ingame with selected players? Better chat support has been something I've wanted for a long time. Please vote on this on Uservoice. Certainly there are more improvements to be made. For one thing, there isn't enough to spend coins on. But people are buying things nonetheless. Could you please move the "full settings" button to the top? Maybe the dialog just needs to be made bigger? How far below the fold is the button? Every step you add to the purchase process will reduce sales, guaranteed. If you require them to buy coins THEN spend the coins, you're adding an extra step. I don't see a problem with supporting both methods, that way everyone gets what they want. Yeah, sounds like a bug on Uservoice. They probably just say "you supported" on every email, regardless of how you interacted with the idea. Website: The Create Coin Game page now scrolls the templates list so the page doesn't get too long. Do we really need Create Coin game section on the site? As every template can be now used for coin games, why not just add 'entry fee' to game creation process? Ahhhh so that's why you use leading zeros in your version numbers. Real shame. Yes, please. A button to turn it off completely would also be nice. Honestly i think we just need to update what information we want in this box, because i like the idea of having the settings we want to see the most at the top (instead of having to find them in the full settings every time). Got an issue with the chat box (standalone, windows 10). as an alternative, it moves up and makes the chat-window even smaller. Keep up the good work Fizzer! well i know this has been like this forever but with Unity it is actually feasible to play with open chat window and therefore i sometimes mistakenly link in chat instead of deploying which is a little confusing. Maybe the Deployment Hotkey can be changed (e.g. Space)? another thing i would "fix" would be the main page of warzone. get rid of all those footer links that dont need to be there (put them under the help tab if you want to keep the info available). and if you already are logged in then the main page should just fwd you to https://www.warzone.com/multiplayer/ already using Muli's script changes. that page is more convenient for browser users. you should promote the use of desktop version more aswell, not sure where it would be better highlighted though or if now would be the right timing to do so since it's still missing a few things you can only access on the browser. I agree that's a better design. There's really only a dedicated page for legacy reasons, hopefully I can find the time to refactor that some day. Yeah I only fixed the ladder page. The Community Dashboard still has this problem, thanks. Thanks for the screenshot. Diplo games definitely have more data there than the games I tested, so I'll address this. Sorry about that, I'll get that fixed. Hmm, it should be. I'll look into that. Thanks! I agree it's a pain point. I'm not sure what a good solution is, I don't think changing the hotkey is a good idea since lots of people have muscle memory around using it. Space wouldn't be a good idea since that would insert a bunch of spaces into chat in your scenario. I can definitely see why it's annoying for expert users. The idea behind the settings summary is to be more newbie-friendly, since the full settings dialog is very overwhelming and confusing to new players. I will re-think this and find a way to make it work well for both. Those are for SEO, and they lose all effectiveness if they're not visible on the screen. Putting them under a drop-out means bots won't consider them visible and therefore weigh them differently. Yeah Mercer wants me to add a promotional video, too. We were going to do that for the Warzone launch but it got cut due to time. The front page's goal is to get people playing the game as fast as possible. I want them to get a taste of the game with as few barriers as possible. Therefore, we don't want to force people to sign up right away, we want them to try the game and then sign up later once they're hooked. If you force a login first, it reduces the number of people who will even be willing to try the game. That's why the "Play" button is front and center. Clicking the Play button already takes you to the app if you're on an iOS or Android device. That page can be improved, but that's the idea. Are you making the case we should link to the iOS/Android app when someone hits the website from a PC? If so, explain your logic, as I would think that if they're on a PC then we should encourage them to play on a PC and not expect them to switch devices. I can understand why you'd say that, as you're multi-player focus, but you have to remember that not everyone is. There are a lot of players who only play single-player. Forwarding them directly to MP would be confusing and unexpected. Also that page is a terrible experience if you're in Unity mode, which new accounts are by default, so that would also be really bad for new players. That page isn't even linked to anywhere when you're in Unity mode. The biggest problem with the standalone client is the lack of ads, which makes it member-only. If I could run adsense in it, I'd certainly allow everyone to use it, make it clearly linked, add an installer, auto-updating, etc. But as a member-only thing most people can't use it, and therefore it's a bit of a second class citizen. It's a pretty bad experience right now due to lack of the things I mentioned -- non-technical users can't even figure out how to install/run it. So it would need more work before it would make sense to promote it. i forgot you can play the basic single player games without being logged in. new user that comes to this page will not realize the mobile and desktop versions even exist until they check the forums. if you have the "available for mobile" logos on the front page, they will realize this immediately and might prefer playing there. If CTRL is supposed to stay the deployment hotkey then the chat link hotkey should be changed. Since with the Unity chat window either the team chat or the public chat are visible one hotkey to link into the active chat (shift) might be enough instead of 2 separate ones in the flash version. Whoa...so I play mostly on my phone and it just updated my warlight to warzone and completely screwed the interface. Am I just behind on updates as I don't see anything about that in the list. How do I get the old interface back? Running current TestFlight version of the iOS app on iPhone X. The chat box sticks out too far when closed. EDIT: this is what it looks like sideways. Apple's concept for the X is they give you a "safe space" and you're supposed to render everything inside there. So the app tries to move everything in so that things like the chat button are in the safe space. It's true the map caching requires more memory, and honestly that's the only reason it's off by default. How much ram does your device have? Does it have to use the RAM? What about saving it in storage? It does both. There's an argument to be made that it should purge it in memory after writing it to storage, which may be the better option for low memory devices.